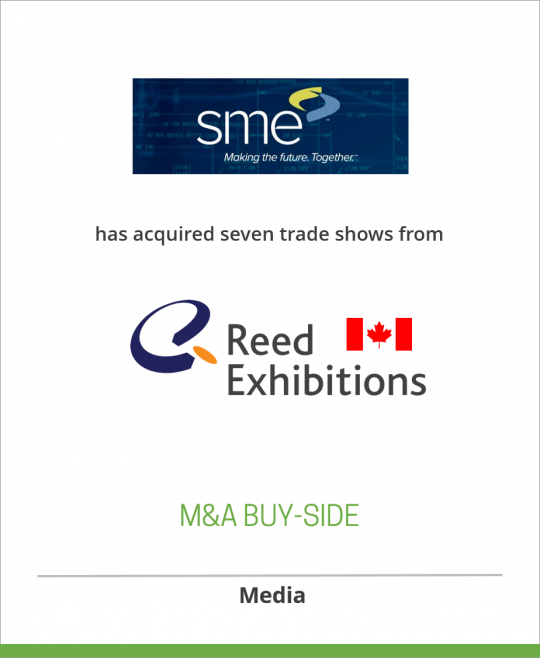 Society of Manufacturing Engineers has acquired seven trade shows from Reed Exhibitions Canada. Reed Exhibitions is the recognized world leader in producing business and consumer exhibitions and events with more than 460 events in 38 countries around the world. Reed Exhibitions Canada is a leading producer of trade shows in Canada serving a variety of markets including the electronics, industrial, manufacturing, woodworking, jewelry, publishing, telecommunications, retail and golf segments. The Society of Manufacturing Engineers (SME) is the world’s leading professional society supporting manufacturing education. Through its member programs, publications, expositions and conferences, SME helps keep manufacturing professionals informed on leading trends, practices and technologies. Soon to celebrate its 75th anniversary in 2007, SME has members in more than 70 countries and is supported by a network of hundreds of technical communities and chapters worldwide.